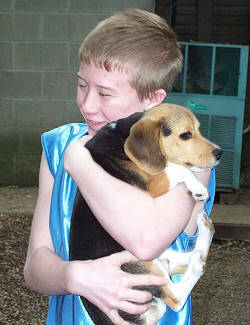 We strongly recommend vaccinations be given at least 2 weeks prior to visiting Sugarbush Kennels. We will not accept pets for boarding within the first 72 hours after receiving the Bordetella vaccine if it is the pet's first Bordetella vaccination. We also recommend all our guests use a flea preventative such as Frontline or Advantage on a year-round basis. Should your pet require veterinary attention during his/her stay with us, we will make every attempt to arrange care with your veterinarian. Notice: The staff strongly suggests you limit your pet's social activities two weeks prior to boarding. This includes wellness visits to your veterinarian. The idea is to prevent illness from inadvertently being brought into the kennel. Our goal is to keep your pet healthy, happy and safe and your help in this regard is most appreciated. If your pet has visited a dog park, pet store, grooming shop or training facility recently and has experienced symptoms such as fever, sneezing, loose stools or lethargy prior to his/her board date, please inform the Sugarbush staff. Your pet could potentially be infectious to other pets in our care. If your pet is under care of a veterinarian for any of these ailments, it is best for your pet and the pets currently in our care for your pet not to stay at the kennel until at least a week after the prescribed medication regimen is completed and your pet's symptoms have ceased.